The massive Romanesque building — it stood six stories high, with short towers rising on each of the four corners — was faced with buff-colored brick and sandstone with terra cotta trim and stretched 125 feet along Superior Street and 140 feet up Fifth Avenue West. The street-level storefront windows utilized a new innovation: double thick plate glass. Its triple-arched Superior Street entrance was twenty-two feet wide and featured ornately carved decorations by George Thrana, including the theatrical masks of Tragedy and Comedy; two sandstone lions guarded the granite entrance stairway, its steps were hewn from gray granite and white marble. The main door was outfitted with hardware made of brass, copper, and nickel. The Lyceum’s auditorium, which could seat 1,368 patrons under crystal chandeliers and an ornamental ceiling, opened August 3, 1891, with Emma Abbott starring in Alexander Bisson’s three-act comedy “Mrs. Wilkenson’s Widows.” The room was seventy feet high, seventy-six feet wide, and sixty-three feet deep and boasted three horseshoe-shaped balconies. About 1,400 light bulbs illuminated the room, and its bronze-and-stained-glass doors closed silently to avoid distracting performances. The emphasis lay on comfort: the seats offered ample room, padded arm rests, and had perforated leather bottoms to keep them cool. In the balconies, the chairs were spaced three feet apart. In the 1890s only Chicago’s famed Auditorium had a stage that rivaled the Lyceum’s, which measured fifty-six feet wide and forty-five feet deep; the opening of its proscenium was forty feet wide and forty feet high. The Chicago firm of Sosman and Landis hand-painted thirty backdrops for a variety of sets, from pastoral scenes to palaces and prisons. Its drop curtain, decorated with “an oriental scene,” was made of fireproof asbestos. Some of the productions were extravagant. In 1903 Ben Hur played at the theater, with a cast of 350 and a chariot race featuring eight horses racing on stage. The Lyceum’s was reported to be the first stage in the U.S. on which Charlie Chaplin performed, but that is not true. He did perform at Duluth’s Empress in 1911. After the Temple Opera House burned in 1896, the Lyceum became Duluth’s only grand theater. Miller sold his interest in the building a year later. By 1915 the five-year-old Orpheum Theatre was drawing patrons away from the Lyceum, as were other forms of entertainment. By the 1920s the Lyceum began showing movies in order to keep the auditorium financially afloat. The building’s spectacular entrance arches were removed and replaced with store fronts and a marquee. 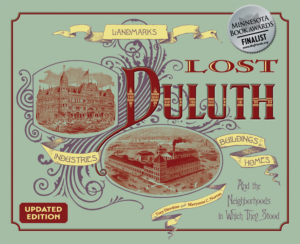 By 1960 the Lyceum was in such disrepair it was referred to as the “Rat’s Palladium.” In February of 1966, it was razed as part of Duluth’s Gateway Urban Renewal Project. The stone lions were given to the Duluth Zoo and the theatrical masks to the Duluth Playhouse at the St Louis County Heritage and Arts Center. The Lyceum was replaced by a building for KDHL-TV and a parking lot. KDLH abandoned the building in 2005 when it merged with KBJR-TV. In 2015 the TV studio was demolished to make room for the Maurice’s headquarters building, completed in 2016.